That time of year again to start something different. If you or a friend would like to start a new sport, why not try something different like skydiving. 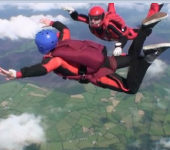 We are the only centre in Ireland to offer 2 different solo jump options for people who would like to learn to skydive and if you have done a tandem with us in the last 6 weeks you may be eligible for a discount. The next STATIC LINE TRAINING DAY is the 5th of March and at the moment we have spaces available. The next AFF TRAINING DAY is the 20th of February but I’m afraid that day is fully booked but we still have places available for the 19th March. Our AFF programme is a very popular and gets booked out very fast and you can always put your name on our cancelation list for a place. If you would like any details on either of our solo jumps just give us a ring on 046 97 30103 / 1850 260 600 and we can answer any questions that you may have. PreviousPrevious post:WE ARE OPEN THIS WEEKEND 13TH & 14TH FEBRUARYNextNext post:AERIAL SHOT OF OUR DROPZONE.